The Canon iR-ADV C3500i and iR-ADV 4500i Revealed! 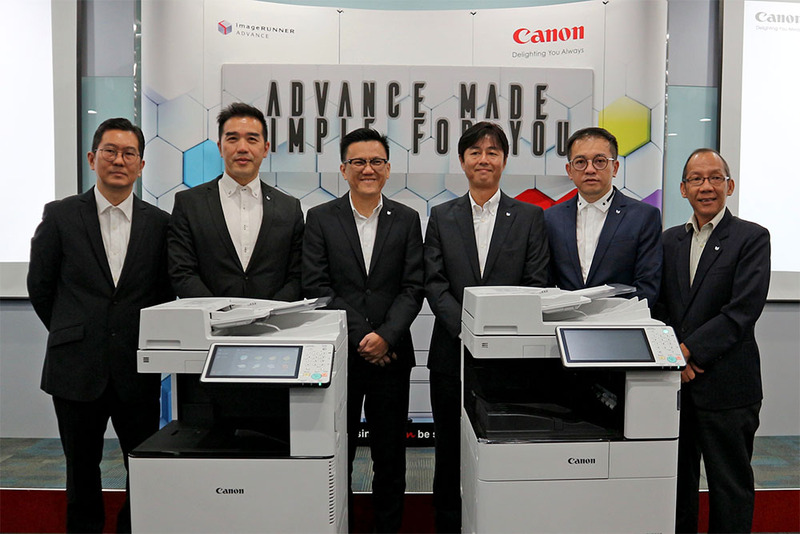 3 MAY 2017 – Canon Marketing (Malaysia) today marked the completion of its imageRUNNER ADVANCE (iR-ADV) Generation 3 line-up with the launch of the new Canon iR-ADV C3500i and iR-ADV 4500i series. Equipped with a 10.1-inch touchscreen, the new iR-ADV series offer an intuitive user experience with familiar smartphone-like gestures such as swiping and pinching for easy navigation across the local user interface. Besides intuitive operation, the usability of the MFDs is enhanced with My ADVANCE that enables the personalisation of settings and workflows. Depending on individual preferences and the nature of tasks, users can customise display language, initial display screen, frequently-used settings, address lists and more, providing a simple approach to streamline workflows. Users can benefit from the same level of customisation via My ADVANCE Synchronisation, where personal settings are synchronised automatically amongst a fleet of up to ten different Generation 3 devices in a networked environment for improved efficiencies. Modern workflows require connection to varied external sources and function in a flexible manner to suit today’s on-the-go workforce. The new iR-ADV series fulfill the requirements of such agile working environments by supporting a wide range of mobile document handling applications such as Apple AirPrint, Google Cloud Print and MOPRIA, as well as Canon PRINT Business. The seamless mobile connectivity allows users to execute critical tasks efficiently, and transfer documents anywhere at the convenience of their time via their connected smart devices. Furthermore, with confidential data regularly moving between various devices, the iR-ADV series provides the user protection through its security capabilities. Business owners can be assured of confidentiality, accessibility and availability of sensitive information that can be stored on the device or during transmission. The latest iR-ADV series feature many device management capabilities targeted at boosting the efficiencies of administrators, providing valuable resource optimisation for businesses. Administrators can easily retrieve usage reports for tracking and cost controlling, as well as manage different levels of device access for personnel, including guest and temporary users. Other time-saving capabilities include quick installing during device relocation or new fleet deployment, and the ease of providing remote troubleshooting at any time. Overall, today’s businesses seek operational efficiencies and a clear return on their investments. However, many are unaware of the true cost of print and information management in their organisation, which can be significant if not managed properly. The total cost of print includes hidden costs associated with information management, output management, IT support and infrastructure, administration and purchasing. Canon’s iR-ADV platform is designed to address these and deliver cost savings to help maximise return on investments. The latest Canon iR-ADV C3500i and iR-ADV 4500i series is now available. Previous : LG 4K UHD TV Now Come With 3 Months Of Netflix Premium!